There’s a saying in real estate that goes “location, location, location”. And that's because accessibility is key, especially for a business. Shopkeepers always want a lot of foot traffic outside their businesses since it increases the likelihood that someone will walk in and buy something. Well the same goes for your website. The only difference is that the “location” that matters is how highly your web pages rank on search engines for your targeted keywords. The problem is, certain industries are competitive, and certain keywords are almost impossible to rank highly for. Even with a deep knowledge of SEO best practices, you’d be hard pressed to rank on the first page for certain key phrases unless you were willing to spend years devoted to SEO. That’s years that a lot of businesses don’t have, especially when you have other things to focus on, like product development and 100 other marketing strategies. So what’s the solution? Do we start looking for a time machine and a SEO specialist? Luckily there’s a little tool called Adwords which can help bridge the gap between SEO haves and have nots. Used correctly, Adwords can help catapult you above your competitor's search rankings for keywords that might have taken years to optimize for. This guide will show you how to do just that. Keywords refer to the set of words that you want to get to the top of the search results for. This could be something like “Organic Smoothie”, or “Marketing Automation Software”. The important thing to understand when looking for good keywords is to put yourself in the mindset of someone looking for your product or service. It’s easy to fall victim to the curse of knowledge and assume that everyone knows what you know when searching for a solution. For example, if you're a massage therapist, you might think people would be looking for an “RMT Clinic” when in actuality, RMT (registered massage therapy) is a term that not everyone is familiar with. When choosing Google AdWord keywords, you might want to choose keywords like “massage” or “massage therapy” instead as it might have a wider appeal, especially to those first time customers who aren’t familiar with the jargon of your industry. Google recommends you have no more than about 15-20 keywords per ad group. An adgroup is just a shared set of ads that all target the same keywords. In my opinion that's actually too many since, with that many keywords, it actually becomes difficult to get specific about what you're offering in your ads. Try sticking to around 10 keywords per adgroup to ensure you can limit your focus and deliver highly relevant results to searchers. If you need some help in finding keywords, create an Adwords account and sign in to use Google’s Keyword Planner. Once inside, type your product or service into the search bar and click “Get ideas” and then select the tab “Keyword Ideas”. 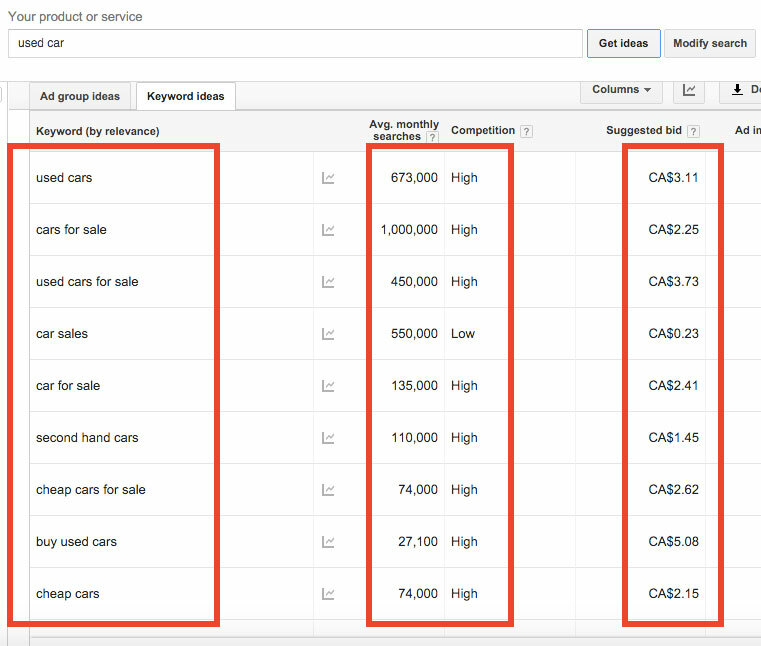 This will return keyword ideas related to my product or service along with their average monthly searches, overall competition on AdWords (how many other people are bidding on these keywords), and the suggested bid price. Try and target keywords with a minimum of 700 monthly searches per month as it will ensure that your ads can reach an adequate number of people to meet your budget. Take note of the suggested bid price of the keyword on the right since you’ll likely need to bid at least that amount or higher to get a highly ranked search result. Continue this process until you’ve found around 10 keywords used to target your specific ad campaign. Once you have your keywords selected, it’s time to start thinking about how you’re going to match those keywords to search queries. 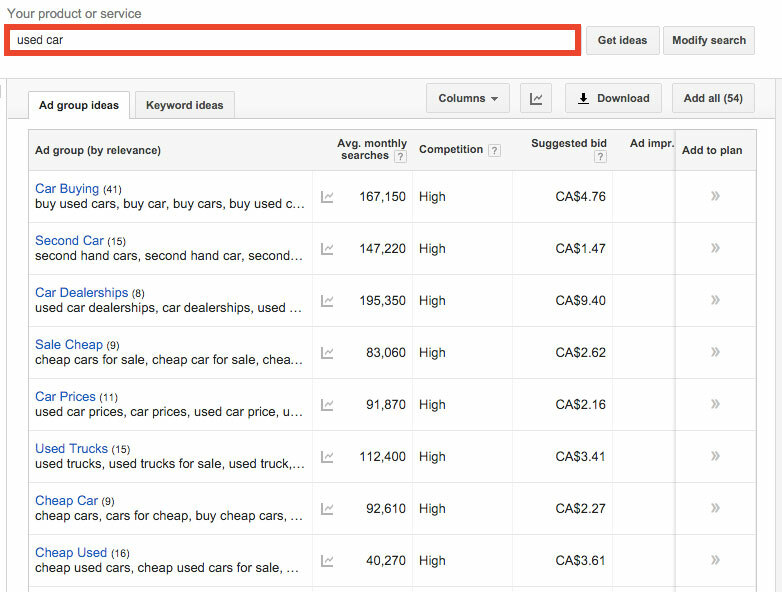 AdWords gives you three match types to get you started. Broad Match - the most broad and general of the matching types. For example, if a user searches "kids boots" your keywords "children's shoes" could return as a result. Search matching can include misspellings, synonyms, and related searches. Phrase Match - a phrase match must contain the keyword phrase within the query. For example if your keywords were "children's shoes" then your ad could show as a result if a user searched "buy discounted children's shoes". Exact Match - this is the most specific of all match types. Users must types the your exact keywords with no extra words, phrases or misspelling. While Google recommends starting with broad match, if your just starting out with and especially if you want to laser in to the top of google, do your research and focus on either phrase matches or exact matches to save money and hyper focus your campaigns. Ads refer to the paid search result that appears after a user submits a search query. They’ll appear directly below the search bar and on the right sidebar if searched on desktop. 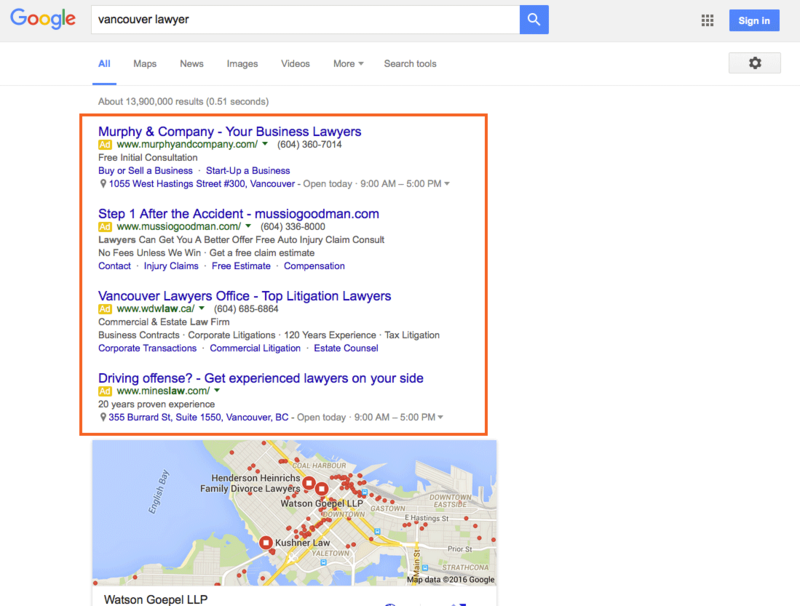 Take a look at the AdWords results that appear in red when a user searches for the term “Vancouver Lawyer”. Notice how many paid results appear for that keyword search? In this example, AdWords results dominate the entire real estate of the "above-the-fold" part of that page. Saying how you're different has a lot to do with giving your prospective customers a unique selling proposition that can help differentiate your company from competitors. One mistake that a lot of businesses make at this stage is focusing too much on themselves by saying things like “10 Years of Experience”, or “Biggest Fleet of Trucks” etc. When saying how you're different, remember to phrase it in a way that is beneficial to your customer. So things like “10 years of experience to get you the best settlement”, or “over 120 trucks available at your call”. A call to action is what your ad is prompting users to do. Do you want them to call you? Do you want them to make a reservation? Remember that in search marketing, you're encountering people who are actively seeking out a solution to a problem. If you have that solution, make it easy for them to take advantage of it. Remember when I told you to only have around 10 keywords per adgroup? Well that’s because the more targeted and tightly knit you can keep your adgroups, the higher the likelihood that people will click on those search results. Google goes a step further and even bolds the exact words of your query if they appear within the description text of an Adwords search result. This works to reiterate the relevance of the search result and help attract more users to your ad (since it was exactly what they were searching for). These three suggestions are what Google provides, but they aren’t exactly tricks of the trade when it comes to creating high performing ads (mostly best practices to get you going). For expert advice on how to set up an AdWords campaign, check out 10 Google AdWords Mistakes You Need To Avoid. 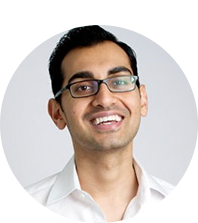 The last piece of the adwords puzzle is a landing page. A landing page refers to the page that a user lands on after clicking on one of your ads. Its primary objective is to push a user towards a conversion goal which could include calling, signing up, making a purchase or giving lead information by filling out a form. Relevant useful content - checking that your ad and your landing page are matched in what’s being offered in the ad. Also ensuring that content on your page is original and useful to the subject matter at hand. Transparency and trustworthiness - clearly indicating what you’ll do with a user's contact information, being upfront about what your business does, and making a clear distinction between ad content and the rest of your site. Ease of navigation - making it easy for users to find what they’re looking for. Website load time - how fast your website loads when a user clicks on your ad. Ensuring you meet these requirements is enough to pass Google’s definition of a “good landing page experience,” but it won’t guarantee an exceptional number of conversions by just meeting this standard. Using a platform like Wishpond, you can start with a high converting landing page template, and manipulate the content to fit your needs. You can also create a landing page from scratch using HTML and CSS, or starting from a template using Wordpress or another type of builder online. Whatever you choose, remember to satisfy both Google’s requirements for a good landing page experience, as well adhering to design principles that contribute to conversion. All three of these elements are important on their own, but also in how they work together. The degree to which your keywords, ads, and landing pages are aligned will help increase the relevancy of your ad scores and in turn bring your overall cost per click (CPC) down. So now that you're aware of the three main areas that contribute to an Adwords campaign, you’re probably getting interested in how much this is all going to cost, right? The good news is that Google isn’t evil and still values a good user experience over a truckload of money from the highest bidder. What that means is that just because you pay more, doesn’t mean you’re guaranteed the best search result. And that’s a good thing. The way that Google determines which ads will be displayed in which order is determined by factoring in an ad’s landing page, expected clickthrough rate, ad relevance, ad extensions, and finally bid price. Taking these factors into consideration, Google assigns an ad rank to your ad which determines what placement your ad will be shown in. What’s important to understand is that each factor contributes equally to the eventual placement of your ad and each can be improved on independently. Once you understand how Google ranks their different AdWords listings, you can begin to focus in on the factors that matter most rather than simply trying to outbid your competitors. Since Google cares so much about user experience, you can bet that by simply giving users exactly what they’re looking for you’ll be rewarded with a good quality score and higher rankings within search results. Be as specific as possible and ensure that what you're offering on your landing page is what users are searching for in their query. This might mean that you’ll need to have different landing pages for your different AdWords campaigns, but it’ll also mean that your landing page experience (and quality score) will increase as a result. Take a look at this example from VWO to see what I mean. In this example, a user searches for the term “heat map tool”. Notice how the ad’s title is an exact match to the search term? This is a very targeted ad group that returns exactly what a user is searching for. 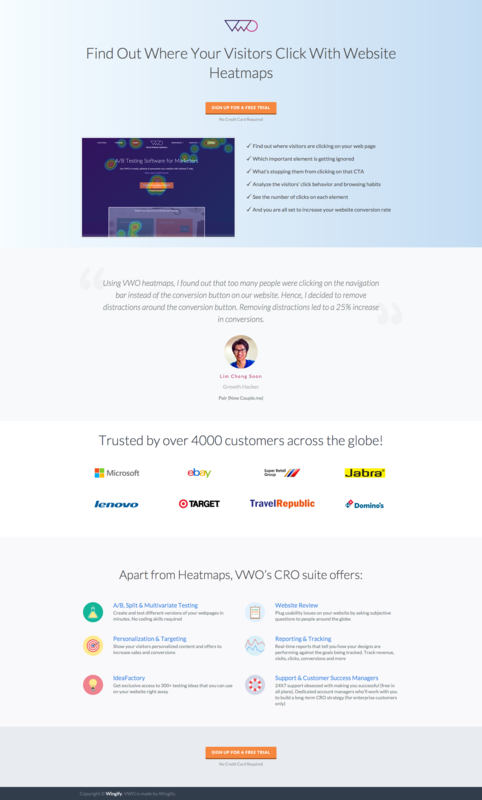 VWO went a step further and put their landing page on the url “/heatmap-tool” to make their search result even more relevant. 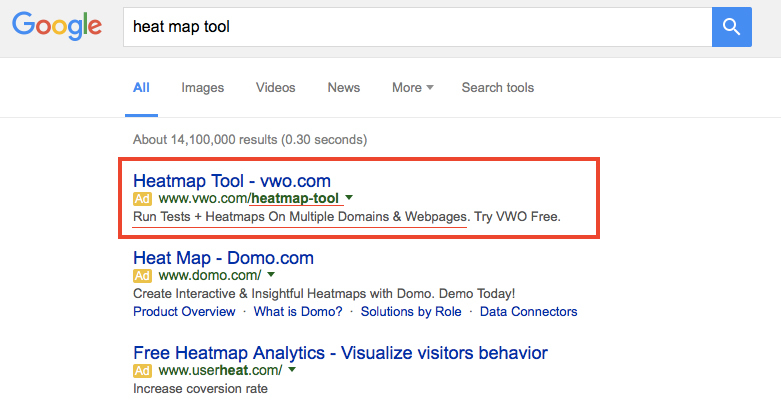 Underneath there is a short description of how you can use heat maps followed by a call to action to “Try VWO Free”. On this landing page, the search term and subject of the page are clearly listed in the page headline followed by a detailed breakdown of some of the different usages of heatmaps. This is a prime example of how businesses can rank highly on AdWords simply by providing users with a unified experience across search terms, ads, and the landing page that follows. Follow this recipe of using specific keyword matches, targeted ads, and dedicated landing pages for each of your ad groups, and you’ll be on top of Google in no time.